Posted by OromianEconomist in Energy Economics. Many hydroelectric dams produce modest amounts of power yet do enormous damage to rivers and fish populations. Why not take down these aging structures, build solar farms in the drained reservoirs, and restore the natural ecology of the rivers? Hydroelectric power is often touted as clean energy, but this claim is true only in the narrow sense of not causing air pollution. In many places, such as the U.S. East Coast, hydroelectric dams have damaged the ecological integrity of nearly every major river and have decimated runs of migratory fish. This need not continue. Our rivers can be liberated from their concrete shackles, while also continuing to produce electricity at the site of former hydropower dams. How might that occur? A confluence of factors — the aging of many dams, the advent of industrial-scale alternative energy sources, and increasing recognition of the failure of traditional engineering approaches to sustain migratory fish populations — raises fresh possibilities for large rivers to continue to help provide power and, simultaneously, to have their biological legacies restored. The answer may lie in “sharing” our dammed rivers, and the concept is straightforward. Remove aging hydroelectric dams, many of which produce relatively small amounts of electricity and are soon up for relicensing. When waters recede, rivers will occupy only part of the newly exposed reservoir bottoms. Let’s use these as a home for utility-scale solar and wind power installations, and let’s employ the existing power line infrastructure to the dams to connect the new solar and wind power facilities to the grid. This vision both keeps the electricity flowing from these former hydropower sites, while helping to resurrect once-abundant fish runs, as has recently happened in Maine…. Posted by OromianEconomist in Africa, Alternative Energy, Energy Economics. Affordable and reliable electricity underpins every aspect of social and economic life. But Sub-Saharan Africa has an energy crisis that demands urgent political attention. Two in every three Africans, around 621 million in total, have no access to electricity at all. 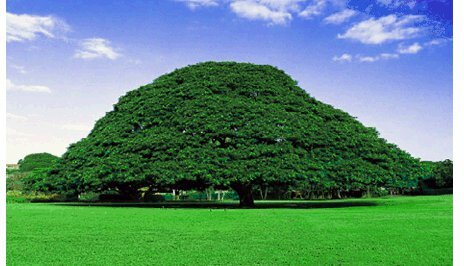 Ethiopia, with a population of 94 million, consumes one-third of the electricity supplied to the 600,000 residents of Washington D.C. Greater London consumes more electricity than any country in Africa other than South Africa. By international standards much of Africa’s energy infrastructure is dilapidated, reflecting several decades of under-investment. According to the IEA, the average efficiency of Sub-Saharan Africa’s gas-fired power plants is around 38 per cent. Similarly, most of Africa’s coal-fired power plants employ sub-critical technologies, rather than the super-critical technologies that could generate far more electricity from the same amount of fuel. Recent super-critical coal-fired power plants built in China generate on average 30 per cent more electricity than those operating in Africa. Economic growth has intensified pressure on Africa’s creaking energy infrastructure. One symptom of that pressure is a boom in leasing of emergency power. Unable to meet base-load demand through the grid, governments are turning to high-cost energy providers using technologies designed to meet emergency needs. Low levels of power generation are both a symptom and a cause of wider development challenges. 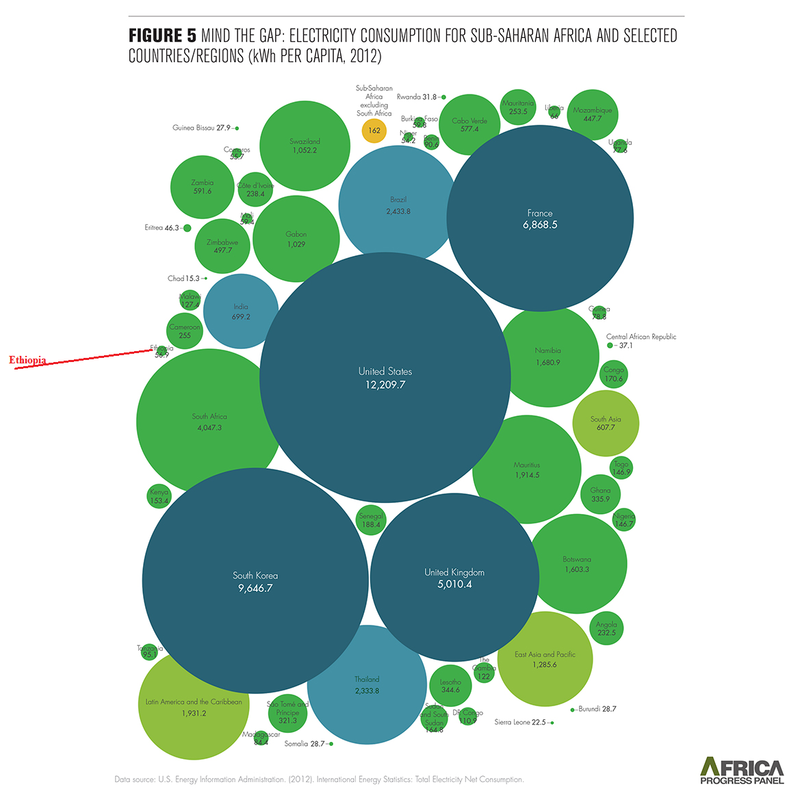 In part, Africa’s limited power generation is the product of low average incomes. But it is also a contributory factor in keeping incomes low. 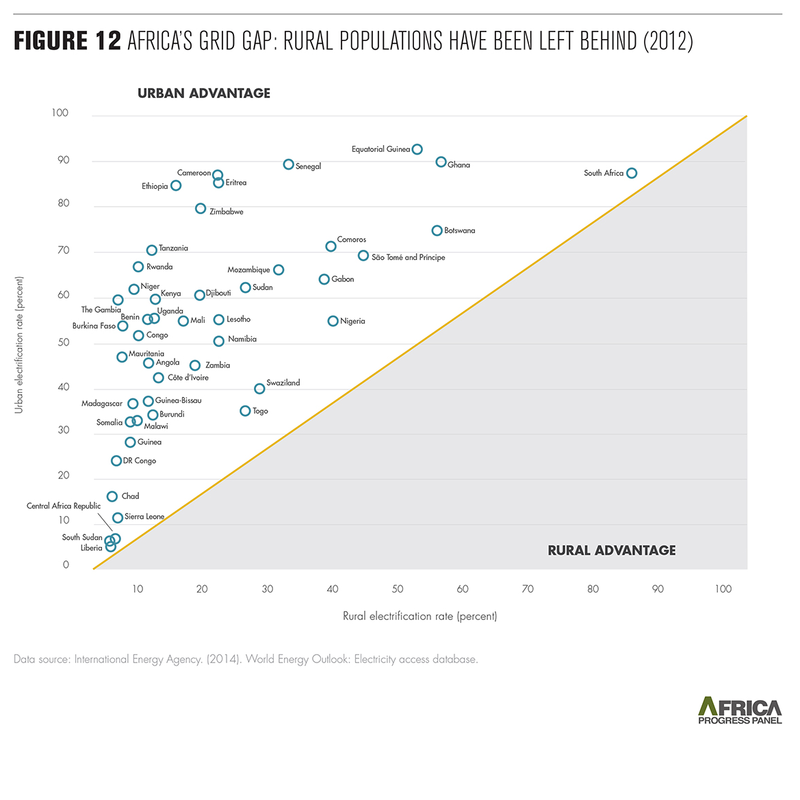 In that context, the widening energy gap between Africa and other regions is a matter of concern. There is a very real sense in which today’s inequalities in energy are tomorrow’s inequalities in economic growth, international trade and investment. Unreliable power supply has created a buoyant market in diesel-powered generators. Around 40 per cent of businesses in Tanzania and Ethiopia operate their own generators, rising to over 50 per cent in Kenya.15 In Nigeria, around four in every five SMEs install their own generators.16 On average, electricity provided through diesel-fuelled back-up generators costs four times as much as power from grid.17 Diesel fuel is a significant cost for enterprises across Africa, even in less energy-intensive sectors such as finance and banking. According to McKinsey, diesel fuel represents around 60 per cent of operator network costs for mobile-phone operators.18 High cost and unreliable supply add to the cost of doing business in Africa, with damaging consequences for economic growth, investment and tax revenues. The World Bank has estimated the losses at 2-4 per cent of GDP.19 Lack of reliable and cost-effective electricity is among the top constraints to expansion in the manufacturing sector in nearly every Sub-Saharan country.20 Small and medium enterprises account for most of the job creation but face particularly severe problems, with around half citing the high cost and unreliability of supply as a barrier to enterprise development. Lack of electricity reinforces the poverty trap Restricted access to electricity has direct and damaging consequences for household poverty. 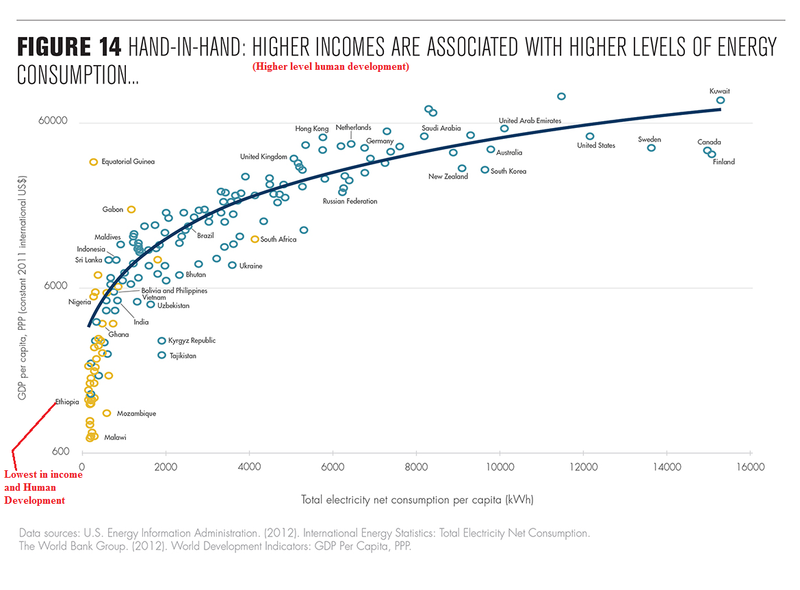 Africa’s poor typically pay higher unit costs for energy than the rich. This is partly because the rich are subsidized, but also because the poor use inefficient energy sources including batteries, candles, and charcoal.If the poor could use more efficient energy sources they could reduce the share of income that they spend on energy and free up resources for other priority areas. It could also reduce the amount of time that women and girls spend collecting firewood and cooking. 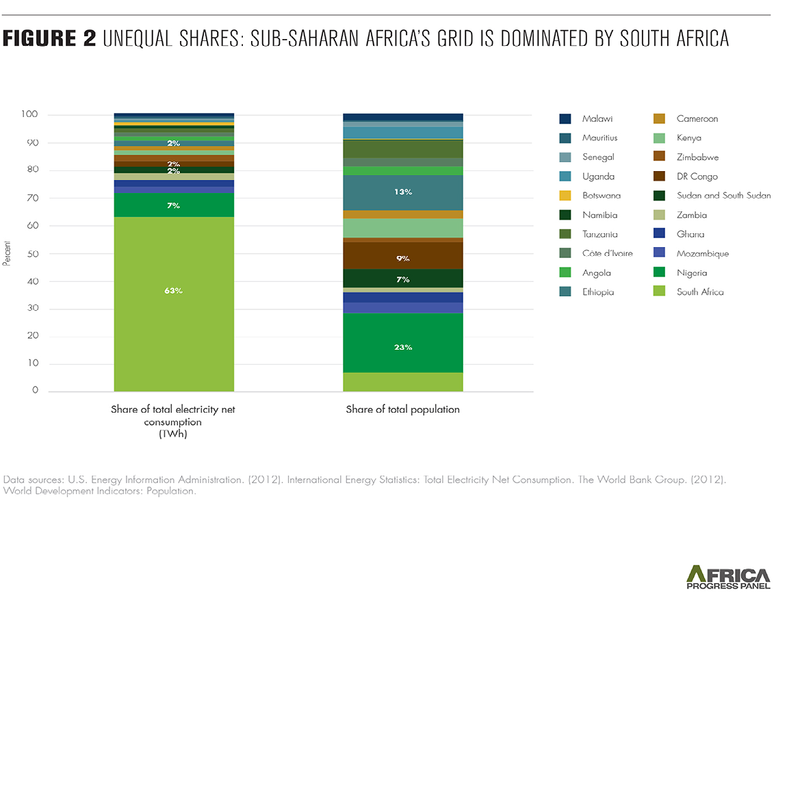 Households across Africa, including very poor households, spend a significant share of their income on energy. Data from 30 countries showed that the average share of household spending directed to energy was 13 per cent.21 The poorest households typically spend a larger share of their income on energy than richer households. In Uganda, the poorest one-fifth allocated 16 per cent of their income to energy, three times the share of their richest counterparts. Women and girls spend a lot of time collecting firewood and cooking with inefficient stoves. Factoring in the costs of this unpaid labour greatly inflates the economic costs that come with Africa’s energy deficits. Estimates by the World Bank put the losses for 2010 at US$38 billion or 3 per cent of GDP. Posted by OromianEconomist in Africa, African Poor, Energy Economics. 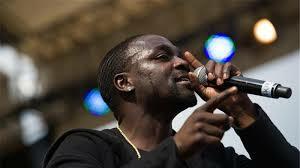 “Politics is at the heart of Africa’s energy crisis. The continent’s power utilities are notoriously inefficient. This is partly down to mispricing and underinvestment. But it’s also because utilities are vehicles for political patronage and, in some cases, institutionalised theft.” “The sheer scale of Africa’s energy deficit often fuels a sense of fatalism and paralysis. Yet on the flipside of this crisis are enormous opportunities. 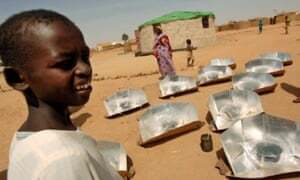 Sub-Saharan Africa has some of the world’s most abundant and least exploited renewable energy sources, especially solar power. With the price of solar panels plunging, there are opportunities for firms and governments to connect millions of poor households to affordable small-scale, off-grid systems. This would help the poorest most.” The Guardian, 5 June, 2015. “We shall make electric light so cheap that only the wealthy can afford to burn candles,” said Thomas Edison, inventor of the modern lightbulb. That was almost a century and a half ago. 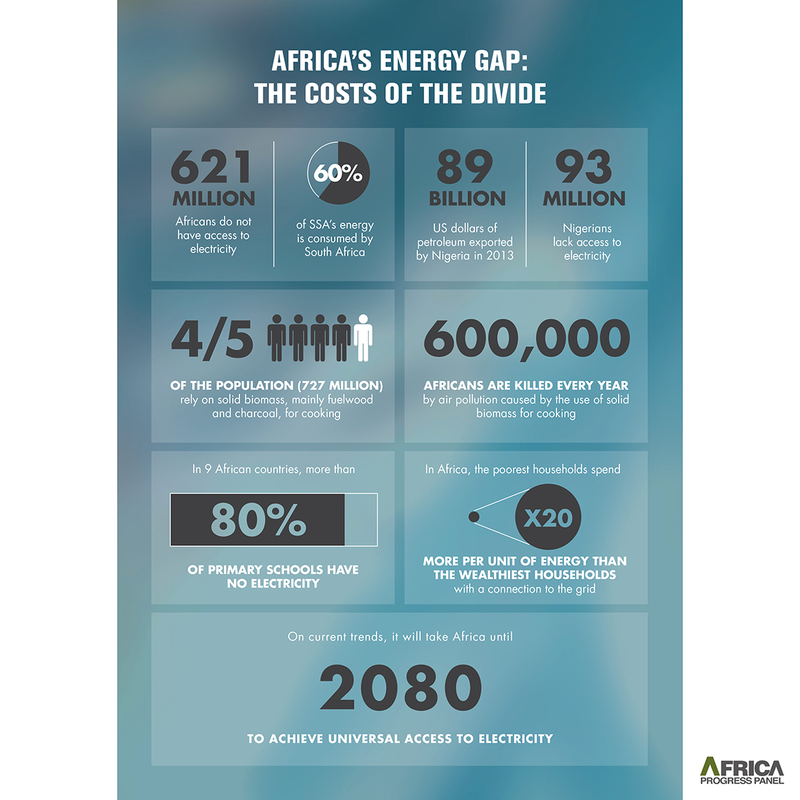 Today in Africa, 621 million people – two-thirds of the population – live without electricity. And the numbers are rising. A kettle boiled twice a day in the UK uses five times as much electricity as someone in Mali uses in a year. Nigeria is one of the world’s biggest oil exporters but 93 million residents depend on firewood and charcoal for heat and light. On current trends, there is no chance Africa will hit the global target of energy for all by 2030. Unlike droughts, health epidemics and illiteracy, Africa’s energy crisis seldom makes the headlines. Yet the social, economic and human costs are devastating. Inadequate and unreliable electricity undermines investment. Power shortages cut economic growth by 2-4% annually. The toxic fumes released by burning firewood and dung kill 600,000 people a year – half of them children. Health clinics are unable to refrigerate life-saving vaccines and children are denied the light they need to study. Politics is at the heart of Africa’s energy crisis. The continent’s power utilities are notoriously inefficient. This is partly down to mispricing and underinvestment. But it’s also because utilities are vehicles for political patronage and, in some cases, institutionalised theft. Some $120m went missing from the Tanzanian state power utility last year through a complex web of offshore companies. The sheer scale of Africa’s energy deficit often fuels a sense of fatalism and paralysis. Yet on the flipside of this crisis are enormous opportunities. Sub-Saharan Africa has some of the world’s most abundant and least exploited renewable energy sources, especially solar power. With the price of solar panels plunging, there are opportunities for firms and governments to connect millions of poor households to affordable small-scale, off-grid systems. This would help the poorest most. The latest Africa Progress Panel report, published this week, estimates that 138 million households living on less than $2.50 a day spend $10bn annually on energy-related products, including charcoal, candles and kerosene. Measured on a per-unit cost basis, these poor households pay 60-80 times more for energy than people living in London or Manhattan. 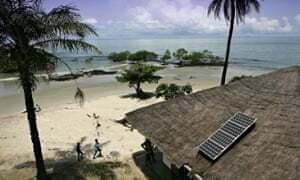 Off-grid solar power could slash these costs, releasing resources for productive investment, health and education, driving down poverty and raising life expectancy. If you think this is a pipedream, think again. Bangladesh has installed more than 3.5m off-grid solar power systems, and the figure is set to double over the next few years. The key to success? Financial and technical support from government, allied to new business models. In Africa, a vibrant off-grid solar industry is poised for takeoff. The only thing missing in most countries is government action to support, encourage and enable this investment. Supporting the development of large-scale renewable energy is not just the right thing to do for Africa. It is also the smart thing to do on climate change. One of the symptoms of Africa’s energy poverty is the destruction of forests to produce charcoal for rising urban populations: fewer trees means the loss of vital carbon sinks. Small-scale solar energy can provide millions of people with a first step on the energy ladder. But it cannot in the medium term fill the energy void left by large-scale utilities. 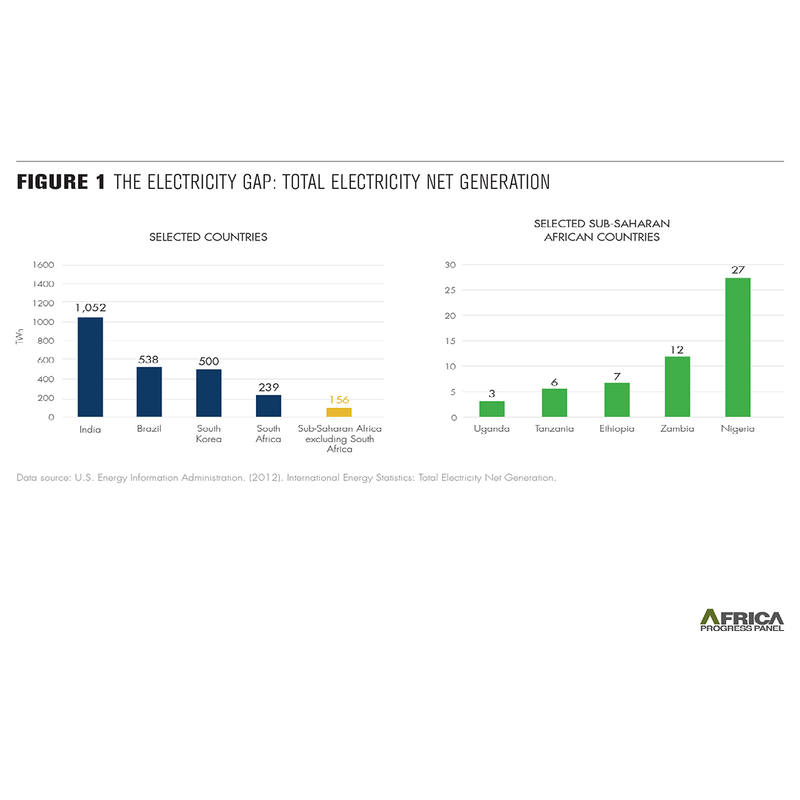 African governments must aim for an annual growth rate in power generation of 10% a year for the next two decades – about five times current levels. Countries such as Ethiopia, Kenya and Rwanda have demonstrated this is possible. Both have simultaneously increased public investment while attracting large-scale foreign investment. Aid donors can help by providing bridging loans and helping to reduce risk. Throughout history electricity has fuelled the growth that has created jobs, cut poverty, and improved the quality of life. Now, almost 150 years after Edison developed the lightbulb, it is time to spark an African energy revolution. We lack neither the finance nor the technologies to do so: all that’s needed is the vital connection of international cooperation and political will. Kevin Watkins, director of the Overseas Development Institute, is lead author of the 2015 Africa Progress Panel report, Power, People, Planet. Posted by OromianEconomist in African Poor, Agriculture, Alternative Energy, Biofuels, Development Studies, Energy Economics. First, dedicating areas to bioenergy production increases competition for land. Roughly three-quarters of the world’s vegetated land is already being used to meet people’s need for food and forest products, and that demand is expected to rise by 70 percent or more by 2050. Much of the rest contains natural ecosystems that keep climate-warming carbon out of the atmosphere, protect freshwater supplies, and preserve biodiversity. Because land and the plants growing on it are already generating these benefits, diverting land—even degraded, under-utilised areas—to bioenergy means sacrificing much-needed food, timber, and carbon storage. Second, bioenergy production is an inefficient use of land. While photosynthesis may do a great job of converting the sun’s rays into food, it is an inefficient way to turn solar radiation into non-food energy that people can use. Thus, it takes a lot of land (and water) to yield a small amount of fuel from plants. In a new working paper, WRI calculates that providing just 10 percent of the world’s liquid transportation fuel in the year 2050 would require nearly 30 percent of all the energy in a year’s worth of crops the world produces today. The push for bioenergy extends beyond transportation fuels to the harvest of trees and other sources of biomass for electricity and heat generation. Some research suggests that bioenergy could meet 20 percent of the world’s total annual energy demand by 2050. Yet doing so would require an amount of plants equal to all the world’s current crop harvests, plant residues, timber, and grass consumed by livestock–a true non-starter. Third, bioenergy that makes dedicated use of land does not generally cut greenhouse gas emissions. Burning biomass, whether directly as wood or in the form of ethanol or biodiesel, emits carbon dioxide just like burning fossil fuels. In fact, burning biomass directly emits a bit more carbon dioxide than fossil fuels for the same amount of generated energy. But most calculations claiming that bioenergy reduces greenhouse gas emissions relative to burning fossil fuels do not include the carbon dioxide released when biomass is burned. They exclude it based on the assumption that this release of carbon dioxide is matched and implicitly offset by the carbon dioxide absorbed by the plants growing the biomass. Yet if those plants were going to grow anyway, simply diverting them to bioenergy does not remove any additional carbon from the atmosphere and therefore does not offset the emissions from burning that biomass. Furthermore, when natural forests are felled to generate bioenergy or to replace the farm fields that were diverted to growing biofuels, greenhouse gas emissions go up. That said, some forms of bioenergy do not increase competition with food or land, and using them instead of fossil fuels could reduce greenhouse gas emissions. One example is biomass grown in excess of what would have grown without the demand for bioenergy, such as winter cover crops for energy. Others include timber processing wastes, urban waste wood, landfill methane, and modest amounts of agriculture residues. Using so-called second-generation technologies to convert material such as crop residues into bioenergy has a role to play and avoids competition for land. A challenge will be to do this at scale, since most of these residues are already used for animal feed or needed for soil fertility, and others are expensive to harvest. There are good alternatives to bioenergy made from dedicated land. 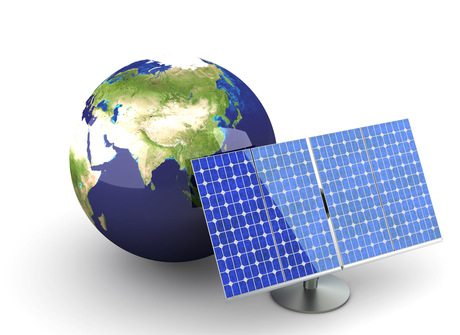 For example, solar photovoltaic (PV) cells convert sunlight directly into energy that people can use, much like bioenergy, but with greater efficiency and less water use. On three-quarters of the world’s land, solar PV systems today can generate more than 100 times the usable energy per hectare as bioenergy. Because electric motors can be two to three times more efficient than internal combustion engines, solar PV can result in 200 to 300 times as much usable energy per hectare for vehicle transport compared to bioenergy. One of the great challenges of our generation is how the world can sustainably feed a population expected to reach 9.6 billion by 2050. Using crops or land for biofuels competes with food production, making this goal even more difficult. The world’s land is a finite resource. As Earth becomes more crowded, fertile land and the plants it supports become ever more valuable for food, timber and carbon storage—things for which we don’t have an alternative source. This blog post was originally published in The Guardian on January 29, 2015. WRI’s Searchinger says land and crops should not be used for bioenergy production, biofuels not curbing climate change.